This important remnant marsh in the middle of Redditch consists of sedge peat, a rare habitat in the Midlands. Ipsley Alders Marsh once sat in open countryside. As the town of Redditch grew around it, 18 hectares were designated as a nature reserve in 1967 and the reserve was bought by Worcestershire Wildlife Trust in 1985. Spring water rises below much of the site ensuring that parts are waterlogged all year round. It is managed as a grazed marsh; small numbers of cattle are on site for much of the year to maintain structural variety within the grassland marsh. On your visit, keep a look out for some of the 170 species of plant that have been recorded here including hemp agrimony, common spotted orchid, fen bedstraw, marsh woundwort and water mint. There are Worcestershire rarities on the reserve including marsh stitchwort and blunt-flowered rush. Winter is a good time of year to catch sight of snipe that feed here as well as providing the opportunity to catch sight of all three woodpecker breeds in the woods. The alders also attract flocks of siskin and redpoll throughout the winter months. Breeding birds include reed bunting, grasshopper warbler and cuckoo in the summer months. Dragonflies are also numerous in the summer; black darter is one of several species recorded here. 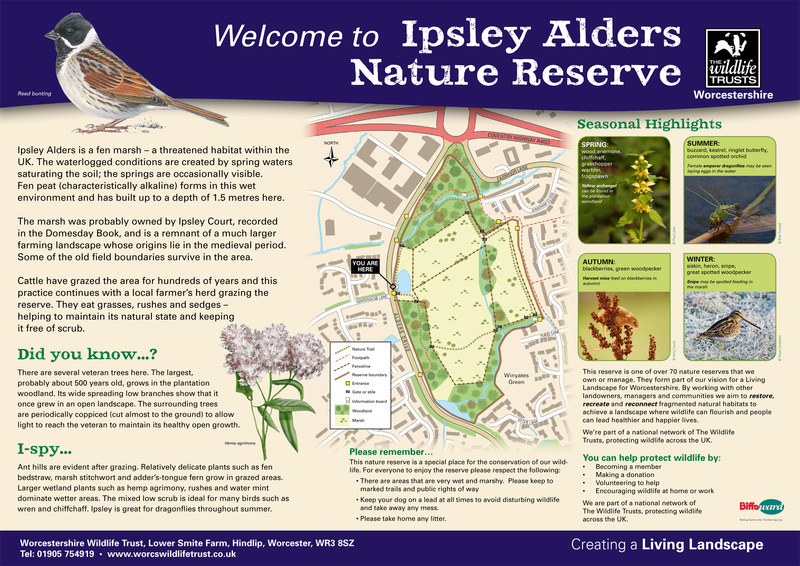 Why is Ipsley Alders Marsh a Flagship Reserve? Follow paths, boardwalk and circular trail waymarkers. Marshland very muddy and boggy all year round. All entrances have gates; shut all gates as cattle grazing.